A free, public lecture on William H. Page's extraordinary 19th century color typography. Dikko Faust and Esther K. Smith will talk about Page, their own experience printing and designing with chromatic wood type, and the 21st century letterpress and wood type resurgence--including new technologies. Registration is requested. 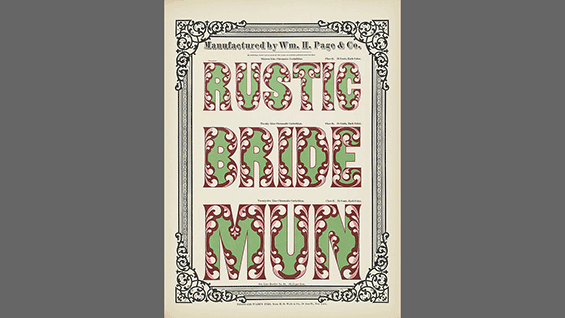 In 1874 Page published Specimens of Chromatic Wook Type Borders &C to promote his Connecticut-based company that manufactured some of the largest and most ornate wood types distributed throughout the world. To publish the book he used inks made by HD Wade & Co which was located in Lower Manhattan. The book's brilliant colors show how vivid things were in the late 19th Century. Clothing faded, buildings were repainted--but protected from sun and dust inside the book, these colors retained their intensity. Specimens text is found poetry which has been compared to Gertrude Stein. Dikko Faust founded Purgatory Pie Press, one of the longest running artist/presses. Purgatory Pie Press limited editions are in public and private collections worldwide including MoMA, the Metropolitan Museum, the Cooper Hewitt, and London's V&A and Tate Modern. Dikko had taught letterpress and run the letterpress shop at Cooper and now teaches at School of Visual Arts where he was instrumental in setting up their type shop. Esther K Smith editor and designer of Rizzoli's 2017 reprint of Specimens of Chromatic Wood Type Borders &c, wrote and co-designed How to Make Books and several other book arts books. Artistic Director at Purgatory Pie Press, she makes limited editions and artist books with Dikko Faust and other artists and writers. Esther had taught the long running artist books classes at Cooper Union and now teaches Experimental Book at SUNY Purchase. This lecture is part of the Herb Lubalin Lecture Series of Type@Cooper. The series is sponsored by the Herb Lubalin Study Center of Design and Typography at The Cooper Union, a public graphic design archive which places emphasis on a hands-on access to a wide range of design and typography ephemera. Recordings of the events are posted to Vimeo thanks to a generous sponsorship from Hoefler & Company.